The French Press Coffee Maker, also called Cafetiere, Coffee Press, Press Pot, or Coffee Plunger is still one of the most popular coffee making device by coffee connoisseurs all over the world. Many say that French Press Coffee is in a class by itself. But what's so special about a French Press and why does French Press Coffee tastes so fascinating? Let's find out! What Is a French Press And Why Is It So Popular? Best French Press Coffee Maker - My Top Recommendation For You! The full immersion of coffee grinds in water in a French Press supports the maximum extraction of the coffee bean flavors. What you get is a cup of rich and flavorful coffee. In addition, the French Press Coffee Maker only uses a mesh filter to separate the grinds from the brewed coffee. Thanks to this unique feature, the coffee oils can pass and give the French Press coffee its distinctive taste. These essential oils are soaked up by the paper filter in a traditional drip coffee maker. There's one disadvantage of using a mesh filter. Not only the coffee oils but also tiny coffee grind particles can pass the filter and find the way into your cup. Therefore, it's always recommended to use a coarse grind size for French Press Coffee to minimize those intruders. But don't get discouraged. This is a little price to pay for the delicious coffee you get. And speaking of "little price". You don't have to pay a fortune for the best French Press Coffee Makers. Even the cheapest French Press for 10 bucks produces a great coffee! You are probably thinking to yourself now: Thomas, there are Coffee Presses on sale for much higher prices, up to $80. Why should I pay so much when you're saying a $10 Coffee Press does it all! Great question! Keep reading and you'll get the answers! But I can tell you one thing right now: the price of a French Press won't make the coffee taste significantly better! It's more about the design, durability and the type of materials used that makes the price difference! The carafe holds the coffee and should be thick enough to not break. Glass is the most common material used in French Presses and is in most cases the cheapest option next to plastic French Presses. Choose stainless steel when you travel a lot or when you want a shatterproof coffee press. Your French Press needs a good filter to separate the grinds from the brewed coffee. The filter mesh should be as dense as possible and there should be no folding lines. Make sure there are no spaces between the carafe and the filter. You might think that the more expensive a French Press is, the better the quality of the filter. But unfortunately, this is not the case. So all you can do is either check hundreds of customer reviews for their long-term experience or trust my ratings below of the top rated French Presses! The plunger is the part of the French Press that pushes down the filter. Usually, the more expensive coffee presses have a better quality plunger which keeps the rod in place. Lower quality coffee presses may leave too much room so it can happen that you accidentally wiggle the plunger too much. As a result, the filter disc is not aligned to the beaker anymore and coffee grinds can escape. ​Cheap French Presses come with a very simple designed, thin lid. They still work fine but you need both hands to push the plunger. One to hold the lid in place, the other to push. The better French Press Coffee Makers have a thick, sturdy lid, that does not fall off, even when you turn the French Press upside down. 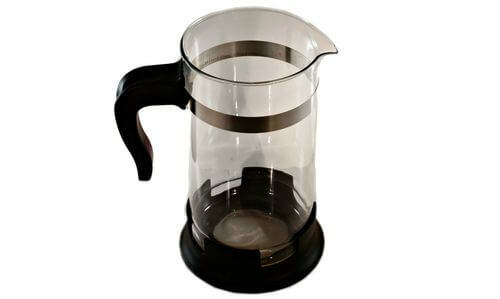 Most Coffee Presses are made of Borosilicate glass or Pyrex glass. Because these types of glass are resistant to thermal shock. If the glass beaker was not heat resistant it could crack or even worse explode when you pour boiling water in it. So when you buy a glass French Press verify it's either Borosilicate or Pyrex glass! Other French Presses are made of Stainless Steel. Most Press Pots are Double Wall Stainless Steel Presses and keep the coffee hot for a longer time. But since the lid is not sealed, of course, heat can escape way faster than with a thermal carafe. The big advantage is that a stainless steel French Press won't break and its elegant design is a great addition to your other kitchenware. But they usually cost a little more than glass French Presses. Some French Presses like the Le Creuset are made of ceramic. This material is heat resistant and, even when I don't recommend it, ceramic allows you to put it in the microwave to reheat the coffee. ​You should know, that a ceramic coffee press is way heavier than a regular glass or stainless steel french press so it's not a good travel partner. They're also way more expensive. But if you want to add another piece of kitchenware to your rustic country style kitchen or already have several other ceramic pieces then go for it! But if you are only looking for brewing coffee alone, you should choose a cheaper glass or stainless steel press. I am always encouraged to support the companies that try to make the world a little better. Grosche is one of them. And that's why the Grosche Madrid deserve to be my top recommended French Press for you. To be honest, the French Press itself is not significantly better than the Bodum's or SterlingPro's that I also recommend further below. But it's also not worse so the combination of high-quality French Press plus a good cause is surely a good reason to go for a Grosche French Press! So what exactly is the good thing that Grosche does? They launched a mission called "Safe Water For All"! For every product they sell, they'll provide 5 days of drinking water for people in need. Check it yourself here! It's also worth mentioning that Grosche uses high-quality "Made In Germany" Borosilicate Glass for their Glass Press Pots. Actually, the glass factory called Schott Rohrglass is only 10 miles away from the small town I grew up. I even applied for a job there but they didn't want me. Hmm..., I think I got side-tracked. According to several reviewers, the plunger is well made, sturdy and goes down straight without wiggling. The lid is deep and sits tight on the press, however, the inner parts are made of plastic - BPA-free plastic at least. Another great feature is the chrome housing which protects the glass beaker. As you can see in the picture above, the glass never touches the surface . So whenever you accidentally drop the Coffee Press too hard, the chrome housing protects the glass from breaking too easily. The Chef's Star Coffee Press is a beautiful, modern designed French Press with a unique third filter I haven't seen in other French Presses - yet! This stainless steel mesh is attached to the lid and filters out the stubborn little grinds that made it through the double screen filters. According to Chef's Star, this is the only press with this third filter feature! The plunger has very little play when pushed down so it won't create any gaps between the filter and the carafe. The glass beaker is made out of Pyrex Glass, a heat resistant, and durable glass. So it's safe for you to pour hot liquid into the cold press without breaking the glass. Depending on how big your cups or mugs are, you can brew up to 6 cups of coffee at a time in this 34oz French Press. According to some reviewers, it's not so easy to remove the stainless steel frame for a thorough cleaning but this is really the only small complaint about this press. So in a nutshell, the Chef's Star French Press is my top recommended glass french press because of its third filter, a modern design, durable Pyrex glass, and not to forget, 99% 4 and 5-star reviews at Amazon! The SterlingPro French Press is made of heat-resistant borosilicate glass and was one of the first Coffee Presses with a double screen filter. Some say the lid wiggles a little bit so you need to hold it down while pouring coffee. Over 90% of the more than 7000 reviewers gave at least a 4-star rating at Amazon so if you asked me, yes I would definitely recommend the SterlingPro French Press! The Bodum Chambord is a beautiful French Press and available in several different sizes. The carafe is made from durable, heat-resistant borosilicate glass and can be removed from the stainless steel housing for thorough cleaning. The plunger is sturdy and does not wiggle too much but the lid could sit a little tighter. Other than that the Bodum Chambord is a great glass french press! The Kona French Press is a great entry level coffee maker and also perfect as a gift for coffee lovers. The heat resistant borosilicate glass is protected by a plastic frame. Unfortunately, the frame is not removable for thorough cleaning. This coffee press has almost 10000 reviews with 75% of 5-star ratings at Amazon. It should speak for itself that the Kona is a great choice! The Espro Glass French Press follows a different path than regular French Presses. The filter is a basket and even if you can't see it in the picture above, inside the basket is a second even finer basket to filter out the smallest grinds. This means that you can use a finer grind size and still get a very clean cup of coffee! A downside could be that the baskets that come in contact with hot water are made of plastic. The Frieling French Press is 100% stainless steel and its double wall pot keeps the coffee hot for about an hour! Just make sure to pre-heat the beaker. Frieling Press Pots are not the cheapest ones and to be honest with you the price won't serve you much better coffee than other stainless steel French Presses. But what's so impressive about the Frieling French Press is how well and precisely it is built. There's no wobbling of the plunger which helps to reduce sediments in your cup. And not only the beaker, even the lid is double-walled stainless steel. Others either have just a single layer of steel or only use plastic for the lid. The Frieling French Press Coffee Maker is available in five different sizes and in two different designs, brushed and polished. The Secura French Press is a 100% stainless steel coffee maker. The lid seems to sit neatly on the press since several reviewers say the coffee stays hot for up to 30 minutes after pressing! Just to make it clear, this is not an insulated press so half an hour of hot coffee is not too shabby!! The Secura Coffee Press comes with a second screen which you can add right away to filter out even more coffee grind particles. The capacity is 34oz. which is enough coffee for about 4 cups. If you need a bigger size, Secura also offers a 50oz. French Press. Impressive are the 95% of 4- and 5-star ratings at Amazon which makes this product one of the top-rated Stainless Steel French Presses on the market! The Kuissential French Press is also a coffee press made of stainless steel and no plastic. 97% of 4- and 5- star ratings make this press one of the best stainless steel Press Pots available. I'm honest, I couldn't find anything special or better about the Kuissential than the others. It does not come with double filter system but seems to not bother anybody and not a lot complain about too many grinds in the coffee. For less than $30 this is definitely a Stainless Steel French Press I would purchase myself! The VonShef French press is made of stainless steel and there's no plastic used at all. Only one single screen filter is used so it's important to use a coarse grind setting to minimize the sludge in your coffee. It's available in 4 different sizes but you shouldn't rely on the cup size only! Buy one size bigger of how many cups you plan to brew because French Press cup sizes are typically measured in 4oz (this counts for most when not all French Presses). One little complaint is that the plunger does not completely go down so if you don't brew a full pot you may have a watery sludge that makes it messier to clean afterwards. The plunger is a little hard to push, but this is not unusual in stainless steel press pots. If there is a blog or website about French Presses, the SterlingPro Stainless Steel Press is always included. No wonder, since it's a bestseller for a long time at Amazon with over 1500 reviews and 95% of them at least 4-stars. Coffee grinds are filtered out by a double screen system and you receive an additional pair of filters as replacement parts. The SterlingPro is a great stainless steel coffee press and also a great gift for any coffee lover! The Le Creuset French Press is a beautiful coffee maker and is a perfect match to your existing Le Creuset kitchen products. You won't find any plastic parts in this coffee press. The carafe is made of dense stoneware and resists stains and scratches from metal spoons. 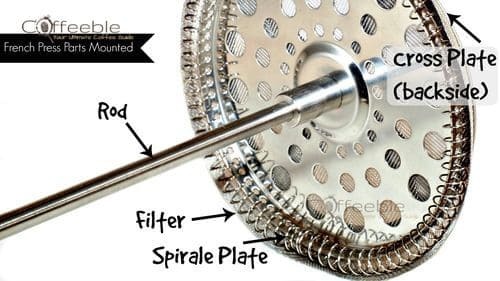 The plunger and filter are stainless steel! There are quite a few reviews that even though, it's made of stoneware, it chips easily. And for the expensive price I was hoping to not see a "Made in China" label on it. The Le Creuset Press is easy to clean due to the enamel coating and leaves no coffee or soap residue in the carafe material. I would say if you have other Le Creuset kitchenware or have a country style kitchen, this is a great French Press for you. But if you're looking for a French Press not because of the material but for coffee making only, you get the same functionalities for a much cheaper price with a glass or stainless steel French Press. Unlike most French Presses, the Forlife Press Pot is available in a variety of colors. Do you want to hear them all? Red, carrot, mandarin, lime, ivy, turquoise, blue, purple, white, grey, and black graphite. The beaker is made of high-fired ceramic and protected by a shock absorbing silicone foot cover. So even when you put it on the counter too hard it should not break! The plunger is made of stainless steel so there are no plastic parts at all in this french press. There are just a few negative reviews about the lid which seem to cause some spill but other than that it looks like this stylish French Press is a good pick! If you're a backpacker, hiker, or maybe even a skier and at the same time can't live without your daily shot of caffeine, you surely appreciate a thermal carafe. Even better when it's a 2-in-1 thermal mug plus french press to brew a fresh cup of coffee whenever and wherever you are. The Stanley Classic Vacuum Travel Press Mug is the perfect companion for this kind of trips. Reviews are mostly very positive. 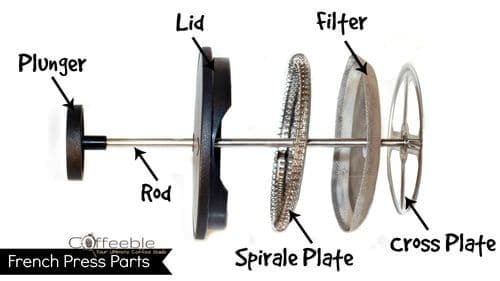 The most frequent complain of the view negative reviews is that parts like the plunger or the thread are made of plastic. The plunger is different from regular French Presses. The inner press is not a rod with attached filters but one big piece with a filter disk attached at the bottom. You can also remove the inner press and use it as a regular travel mug. I was close to not choose the Stanley as the top recommended travel French Press! Why? Maybe you think I'm overreacting, but I just find it difficult to grasp that Stanley was not able to provide Amazon with images in the English language. Instead, they present us pictures and descriptions in Chinese. But that's just lazy marketing and shouldn't compromise the value of this great travel french press! The ongoing battle between the French Press Vs AeroPress! Read my coffee press guide and you are able to nominate the winner yourself! French Press vs Coffee Maker: their individual features, pros and cons and a buying guide for you to make the best decision. The SterlingPro French Press guarantees grounds free coffee. Read in my full review how this coffee press solves the problem with nasty sediments. By reviewing the Bodum Chambord French Press Coffee Maker we will look at the design, the brewing process, coffee to use, the pros and cons and much more.